Do you love applesauce? 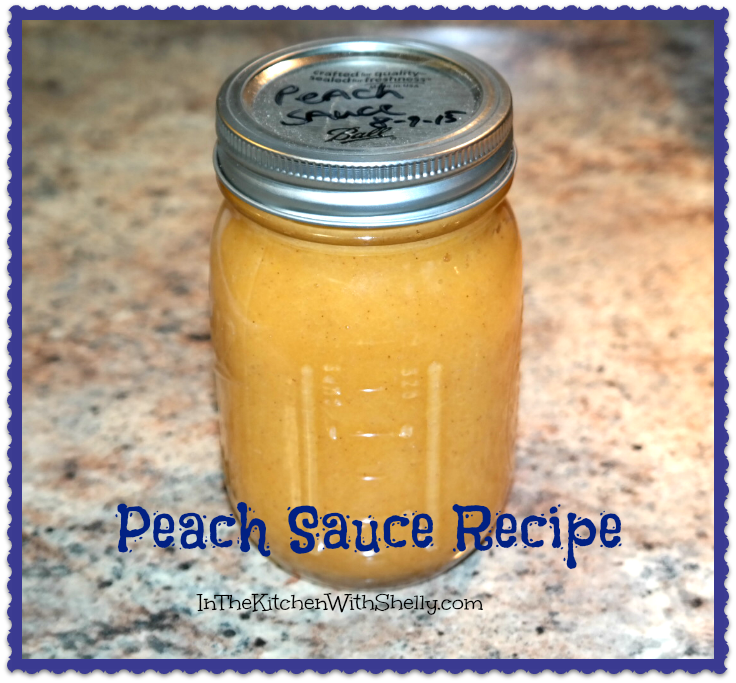 If so, I think you will love peach sauce even more! If you have ever made applesauce...making peach sauce is just about the same. Every year I like to make a big batch of peach sauce and can it for use during the winter. In my honest opinion...I enjoy it even more than applesauce! This recipe will yield approximately 6 pint or 3 quart jars. Wash peaches under cold running water; drain. Fill up a large stockpot with hot water and bring it to a boil. Place peaches into the water for 30-45 seconds and remove. Place them into a big bowl of cold water to cool them down. Once cool...carefully pull off their skins, remove the pit and cut them into quarters. Treat peaches with Ball Fruit-Fresh Produce Protector. Place water, lemon juice and granulated sugar into a large pot. Turn heat to medium-high, stirring often to get sugar to dissolve. Add the peaches and turn the heat down to low. You may need to add more water depending on how thick it is. Stir in the ground cinnamon and optional ground ginger. Simmer mixture over low heat until the peaches cook down and are the consistency of applesauce. Fill hot canning jars with the peach sauce leaving a 1/2" headspace. Remove air bubbles and clean the jar rim. Center lid on the jar and adjust bands to they are finger-tip tight. Place jar on the rack of elevated wire rack over simmering hot water in your water bath canner. Continue until all jars are filled. Lower the basket into the simmering water and turn up the heat to medium-high. Water must cover the top of the jars by at least 1" and be boiling. Cover the canner. Process pint jars for 20 minutes and quart jars for 25 minutes. Turn off heat and let the jars sit in the hot water for 5 minutes. Remove jars from the water bath canner and allow them to cool. After 12 hours have passed, check them all to make sure they have sealed properly. I have made a peach sauce , but never in canning. I also.like the idea of adding the ginger to it. That way I find it to be a better accompaniment to a regular meal.